Chinese Premier Wen Jiabao said Friday that the relationship between China and Britain has entered a "mature period." "The leaders of the two countries have treated bilateral ties from long-term and strategic perspectives to make the relations develop steadily and enriched with new contents," said Wen in a meeting with British Secretary of State for Foreign and Commonwealth Affairs Jack Straw. Wen said China and Britain, both permanent members of the Security Council of the United Nations, shoulder common responsibility for safeguarding world peace and development. He said China will maintain high-level exchanges and cooperation in various fields with Britain to push forward their comprehensive and strategic partnership. Wen expressed appreciation for Britain's adherence to one-China policy. 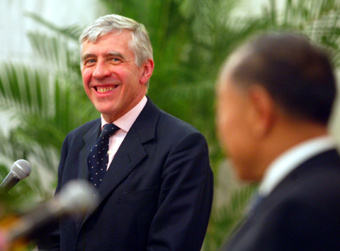 Straw said China and its relationship with Britain have made remarkable achievements since he visited China two and a half years ago, noting that the two countries established comprehensive and strategic partnership last May when Premier Wen visited Britain. The two countries have kept close contact on international and regional issues, Straw said, adding that Britain is willing to expand cooperation with China in all fields including political and economic areas.